In honor of my recent return from what was probably my last beach vacation of the summer, today I am wearing Aqua Motu by Comptoir Sud Pacifique. Aqua Motu was originally released under the name Motu in 1992, and I believe the fragrance was reformulated when it was renamed. The notes for the current version are helychrisum, marine notes, lily of the valley, warm sand, and kelp. 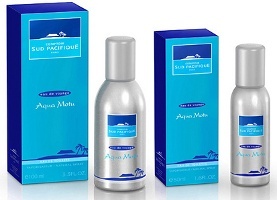 I have never been a big fan of marine fragrances, but I adore Aqua Motu. It smells absolutely nothing like the mid-Atlantic beach where I now spend my summer vacations, and truth be told, it probably doesn't really smell like an actual beach anywhere. All the same, in a way that I can't exactly explain, it is an almost perfect, filtered-by-memory olfactory snapshot of the beach in La Jolla where I used to live. Aqua Motu starts with a blast of ozone, and after that it smells pretty much like a synthetic version of a beach: sea air, salt water, some kelp, and the gnarled little shrubs that grow along the coastline in Southern California. It is a mild fragrance, lightly sweet, and pretty much linear once it settles. What is happily missing is the tourists: there is no suntan oil that I can detect, and no tropical drinks. Just the beach. I would be hard pressed to defend Aqua Motu against the charge that there are better marine fragrances out there. There probably are. But I have yet to find one that smells so much like the particular beach in my memory. Wearing it is an exercise in nostalgia for me. It is just as well that it is not particularly long lasting, as a little nostalgia goes a long way. Aqua Motu is an Eau de Toilette. For shopping information, see the listing for Comptoir Sud Pacifique under Perfume Houses. Welcome back!!! I hope you had a great time and ate lots of crepes. I wish I could add a useful comment but alas – I cannot since I cannot remember if I have tried Aqua Motu or not. Marine fragrances normally do not appeal to me but perhaps next time I am in Aedes I will revisit CSP. Until tomorrow – enjoy! Hi F, and thanks for the welcome! I really don't think you would like Aqua Motu. I don't think I would like it if it didn't bring back so many memories for me. Wonderful review! I hear that Motu is similar to Montale Sandflowers. Do you find it to be the case? Actually, I like some fragrances from CSP, especially when I need something light, uncomplicated and fun. My favourite is now discontinued Tiare (Aloha Tiare is not the same). I also like Vanille Banane. They are better priced in France, though. V, Sandflowers is spicier and less “fresh”, which is probably a good thing but it doesn't smell like La Jolla, so it does nothing for me. I really have not tried enough of the CSPs. I like the Gouvenour & the Ecume de Thé, but both were short lived on me. Bois de Filao is also nice. Aqua Motu is VERY synthetic smelling, and I just can't see you liking it. It is one of those scents that just smells like it was created in a laboratory using no natural materials whatsoever. The CSPs are sometimes too sweet for me, but I do like a few of them. And you are right, you can't fight nostalgia! I have not tried either of the CSP Tiare versions, but if you want floral and coconutty, do try the Montale Intense Tiare. PBI, C, you should try Aloha Tiaré. Granted, it is not as beautiful as original Tiaré, which is definitely floral and coconutty, but it is well-done. Intense Tiaré also smell more a rich frangipani mixed with gardenia on my skin. I like it as well. Too tired to reconstruct that post, but all I can say is stay away from the Scrapple! Don't let anybody there even mention the word in your family's presence. Vile stuff, everything in it but the squeal, as we used to say. A, thank you so much for taking the time to comment again! The commenting problems are making me nuts, but they promise it will all be fixed by the end of the week. I have actually eaten scrapple. Agree completely, it is vile, nasty stuff, but of course, I do know people who love it. R, I don´t know if Attar Bazaar is available in Gemany – I´ll search for it! May I make one comment about Attar Bazaar? I *used* to love them. Then you know how you get tired of something and put it away? Well, when I took them out of the drawer after a few years, they had all morphed into a singular sweet strange scent. The base note juice must be used for all of them, and it is just boring. That said, it is an inexpensive line, and if you're not going to become emotionally involved (sob, sob, my Tunisian Frankincense smells like my Tunisian Amber, etc., sob), then go for it. The perfumer, Hakim Chisti, is a Unani healer, which puts a cosmic spin on them I corresponded with him a few years ago (before the base juice discovery) and he is lovely, have one of his books, too, Sufi Healing, which puzzles me even more about the juice. Oh. Well. For a nice coconut scent, i use virgin organic coconut oil VOCO. Many health food stores here carry it now. Inexpensive, moisturizing and lovely coconut scent. you can layer it with the top note of choice. A, do you usually expect perfume oils to last a few years? I am not at all surprised if a perfume turns before that, although many last longer. there's no other word for it — stupid, as in not clever, not intelligently designed, just stupid. Stupid perfumes — there's a new theme! Ok, that makes sense! I don't really have enough experience with the line to comment further — have only tried samples, and most of those I tried were too soapy for my taste. Oooo… R, Thanks for another timely review. I am going to Malibu and then La Jolla in two days for a wedding. My Doogie Howser best friend is lucky enough to live for half the year in California, curing people, damn her helpful soul. I'm hoping to drive my rented car into LA (always an adventure with me driving) and go to Barneys, so I will have to smell this – along with everything else. I put off trying my Malle samples until this week – I'm a hoarder – and now I desperately need PdT. The website, admittedly for the New York store, says it is sold out! Can this possibly be true? Can I at least get the little travel ones? I haven't even tried the Musc Ravaguer yet! What if they're sold out of everything – the Lutens, the Motu, the Malles – after I have waited months to get to a proper store and they've just extended my credit limit! Agh! Oooo… R, Thanks for another timely review. I am going to Malibu and then La Jolla in two days for a wedding. My Doogie Howser best friend is lucky enough to live for half the year in California, curing people, damn her helpful soul. I'm hoping to drive my rented car into LA (always an adventure with me driving) and go to Barneys, so I will have to smell this – along with everything else. I put off trying my Malle samples until this week – I'm a hoarder – and now I desperately need PdT. The website, admittedly for the New York store, says it is sold out! Can this possibly be true? Can I at least get the little travel ones? I haven't even tried the Musc Ravaguer yet! What if they're sold out of everything – the Lutens, the Motu, the Malles – after I have waited months to get to a proper store and they've just extended my credit limit! Agh! Sorry about the comment troubles, Tigs, I deleted the extra copies. If Aqua Motu smells nothing like La Jolla to you, don't even tell me — I'd rather preserve my nostalgia trip, LOL! I'm sure it will smell the same to me – of sea air and water, kelp, scrubby plants, and oh yes, *money*. You lived in La Jolla? Did you have to sell your organs? I was a graduate student at UCSD, and I lived in a grad student apartment for almost no $$$. Those were the days! Later when I was a wage earner, I lived up north in Carlsbad, which at that time was very cheap and I lived about a block from the ocean. I doubt I could afford it at today's prices. Finally got this (yay!). It was backordered, so it took longer. Well, you were right – it really does have that comforting ocean scent with none of the tourist sunscreen. But my first thought when I smelled it was “Don't I already have this?”. And so today I tried an experiment – Aqua Motu on one arm and Salt Air by Demeter on the other. They are not the same compared side by side, but very, very close! Sisters maybe. The CSP has a bright lime top note to me, but fades into a sweet ocean scent and stays there. Salt Air starts with alcohol and very synthetic ocean scent (most Demeters have a big alcohol punch in the beginning to me), but dries down into a sweet ocean scent too. Surprisingly the Salt Air lasts longer on the skin (most of the Demeters I've tried fade within a couple of hours into nothing) it's after work and has been since 8 am since I put them on, if I press my nose to my arm I can still smell the Salt Air, but not the CSP. So, in conclusion: love the Aqua Motu, and next time you order minis from Demeter you should try the Salt Air too! *Sorry for the long post! Gosh, I didn't know there WAS a Demeter Salt Air! There are so many Demeters, I can't keep track of them all. I will try it, the Aqua Motu is expensive, and I really just want a little spritz once in a blue moon.